Boo loves to match. Not like her shirt matching her pants; she comes up with some pretty...inventive outfits. No, she likes to match other people. 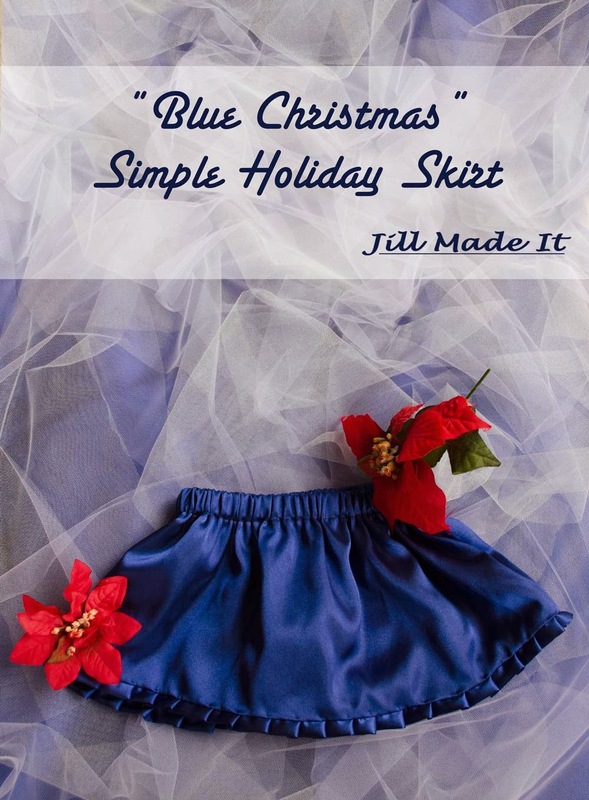 So she will be so excited when she and Daddy's Girl unwrap matching Blue Christmas Skirts on Christmas morning. These are really basic skirts, but the nice thing about "basic" is that you can easily add your own spin on it. Both skirts are made from the same blue satin (surprisingly affordable, yet it adds a bit of "special" to the outfit). 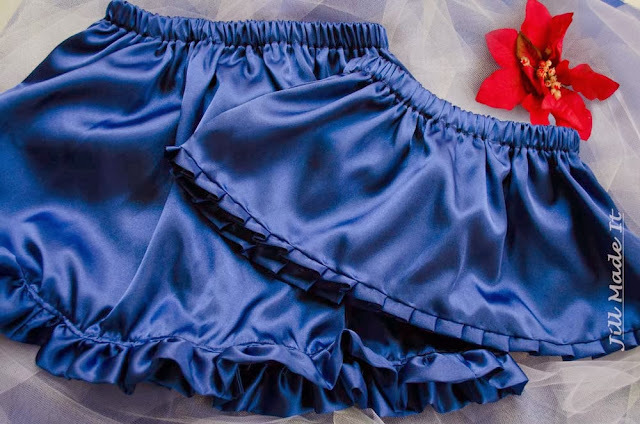 Daddy's Girl got pleats on her skirt, Boo got ruffles. I love variations on a theme. Oh, ruffles, why must you be so cute, yet so annoying to make? 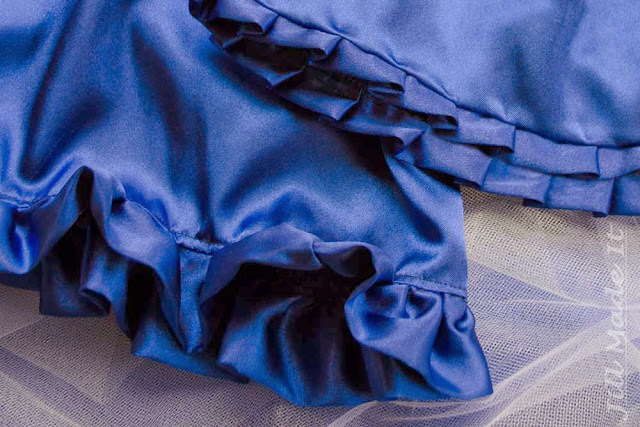 I actually prefer making pleats than ruffles. I don't have step-by-step pictures, since I sewed these up at night so the girls wouldn't see their Christmas presents. (Read: There was really bad lighting for pictures.) But the skirts are so easy. Cut the elastic to your child's waist measurement. Don't add seam allowance—you need the elastic to stretch a little so the skirt stays up. Cut your skirt fabric as shown in the picture above. 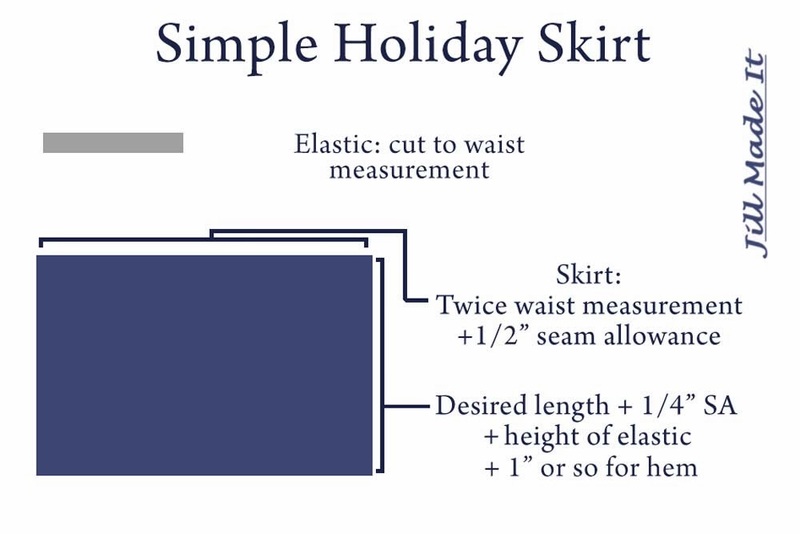 Or, if you want a fuller skirt, cut a longer rectangle. Less full, closer to square. Make your hem by folding the bottom edge over a half inch, then fold again another half inch. And sew it down. A decorative stitch with a contrasting thread could be a nice way to add some detailing. 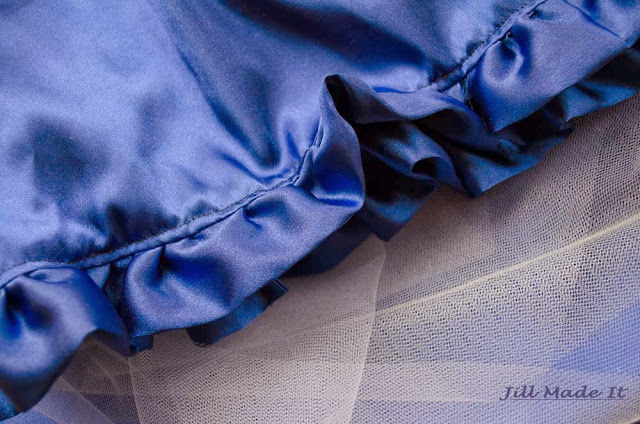 You could also hand stitch for a less visible seam, or use the blind hem stitch on your sewing machine. But that's another tutorial. Now you'll make a casing. Just iron the top edge down a quarter inch, then fold down again whatever size you need to fit your elastic. Sew this down, too, being sure to leave a little space for inserting the elastic. And insert the elastic. Attach one safety pin to the leading edge so it's easier to thread it through, and another securing the other end to the fabric so it can't pull all the way through. (Hate it when that happens.) Once the elastic's through, overlap the two ends by a half inch and use a zig-zag stitch to secure them. Topstitch the casing closed, and you're done! Now that you know how to make a basic skirt, you can change it up to make so many different looks! Besides adding ruffles or pleats, you can make the skirt more or less full, longer or shorter, try color blocking, or a paper bag waistband...I think I'm going to try a scalloped hem next time. Don't miss any posts as we Sew a Song of Christmas!